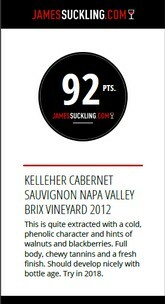 Ratings 92 Points-Robert Parker "The 2012 Cabernet Sauvignon reveals ripe blackberry and blackcurrant fruit with graphite, licorice, forest floor and new saddle leather, with toasty vanilla lurking in the background. It is full-bodied, fleshy and dramatic as it is a faithful reflection of this ostentatious and impressive vintage. Drink it over the next 12-15+ years. "